Published: . Filed Under: Surviving Kids. Antepartum depression, or depression during pregnancy, affects more than 10% of pregnant women. Learn the symptoms and tips for what to do if you are dealing with this rarely discussed symptom of pregnancy for too many mothers. While I was contemplating if and when to have a second child, I thought a lot too about the more obviously difficult parts of my labor and delivery: the emergency c-section and my recovery from that. I remember during that time I saw a pregnant Facebook friend’s complaints about her wild mood swings during pregnancy. Immediately, I thought, Well, at least I didn’t have to deal with that. But then I remembered, Yes, yes. I did. Why did I refuse to acknowledge — even to myself — this huge aspect of my pregnancy? Somewhere around the middle of my second trimester I started to feel not myself. On the face of it, I was doing really well. After a debilitating period of morning sickness during my first trimester, I was feeling physically great. My dissertation research was progressing well. My husband and I were excited about our plans to buy a house and move to upstate New York. Then I couldn’t sleep. Normally I’m not a good sleeper. I’ve occasionally struggled with sleep issues during certain periods of my life. But this was different. I literally could not sleep. I would lie awake at night for hours, all night. I became anxious, teary, irrational even. I became even more upset when I didn’t understand what was wrong. Because there was nothing wrong. I was happy, healthy, and excited about the future. But I was a mess. I would cry for hours, writing in my journal about how I was too weak of a person to become a mother. I couldn’t think about anything except how my own potential breakdown could be affecting my growing baby. I pictured my own stress hormones surging into my poor developing baby and would become even more upset. Finally, I went to see my ob/gyn. I told her what was going on, that I couldn’t sleep, that I had never been so anxious and depressed for no reason in my life. We talked about medication, but I was appalled at first at the thought of beginning an anxiety medication or antidepressant during my pregnancy. She referred me to a psychiatrist at Mass General Hospital who specialized in women’s reproductive mental health, one of the top centers in the country. When I showed up for my first appointment, I sat in the waiting room, holding back tears. What was I doing in a psychiatrist’s waiting room? I had a wonderful husband and a great life. I could see that there were mentally unstable people all around me in the waiting room — the old woman with matted hair, the skinny and pale adolescent girl. Was I one of the crazy ones too? How would I ever be a good mother if I couldn’t get it together? The psychiatrist was wonderful, an expert in her field. She was gentle, reassuring, and calmly, without judgment, told me about my options. I was lucky because, with her help, the darkness and anxiety went away by my third trimester. I was back to being myself, admittedly a much larger, awkwardly moving, and bloated version of myself. And now, thinking about my friend on Facebook and her mood swings, I wonder if she’s doing okay. We’ve made tremendous strides in increasing awareness about postpartum depression. But depression during pregnancy — or antepartum depression — is not as widely recognized. Pregnancy is supposed to be a joyous time, a period of some minor physical discomforts but mainly a time of anticipation and glowing, giddy maternal pride. Instead, during my pregnancy, I felt like I was taken over by a dark and silent force in my mind that caused me to feel hopeless, guilty, and inadequate. I never experienced anything like it before or since. Now I know that I was never alone, even though it felt like that. About 10- 12% of women experience depression during their pregnancies. Yet it’s much less commonly screened for than postpartum depression. Anxiety, feelings of sadness and hopelessness, trouble with concentration, loss of interest in typical activities, changes in sleep patterns. If you feel sad, depressed, or hopeless during your pregnancy, tell your doctor about your feelings honestly and ask for help. There are a wide variety of treatments — not just medications — that are highly effective and can make you feel better. No one knows exactly why some women experience depression during pregnancy, and others do not. Genetics, previous history of trauma, and prior mental health challenges may be risk factors. Greater awareness and screening of this condition could lead to less suffering and better outcomes for both mothers and babies. Too many health care professionals do not ask about depression symptoms during this time. If you are experiencing symptoms of depression during pregnancy, don’t suffer alone. Because you are not. Did you experience depression or anxiety during your pregnancy? Did you seek treatment? Jessica, I really am in awe of you. Seriously you are so brave and courageous to share this here with us. I never had depression during pregnancy itself even when I was put on bed rest, I mean I definitely had my moments, but for the most part I tried to keep it all together. After having each of my girls, I think I had a few days each where I had what they call the baby blues, but with my first who had colic, I truly think I was in such a state of shock to even let myself feel anything more. And then with my second, I remembered feeling a bit down that because of all my high risk issues I most likely wouldn’t go back and try for another, but then that passed pretty quickly, too. But I really do admire you being so frank and honest and laying out the options for those who may be going through similar and I will tell you I think it does help if you are going through something like this that you aren’t alone and that others have, too been there before. And thank you also for linking up with us again today. I had no idea you experienced that- I can only imagine how disorienting and terrifying it must be to not feel like yourself during such a crucial transition. I am so glad you are writing about it, and I am dying to read that book, too! I agree with Deb- the light-shedding is so brave, and so necessary. So sorry that you had this bleak period in your life, especially during your pregnancy when your health concern was not only for yourself but also for the baby you were carrying, too. I think your writing will be so very helpful to other young mothers who might have felt similarly; you provide an excellent example in your frank discussion about your decision to seek help and the steps you took. Thanks, Mary Kathryn! I did see that article, although I haven’t read it carefully yet. We’ve been writing so much (with our Around the World Parenting Carnival) about cultural differences in parenting practices. But those cultural differences really start far before childhood even begins! Such a brave and important post, Jessica. I for one was not aware of antepartum depression but it makes perfect sense to me that one could go through this in anticipation of possibly the biggest life changing event you’ll ever experience. I’m sorry your experience was clouded by this but I’m happy you got great help and happy you are sharing this today. This is a great, informative post Jessica! 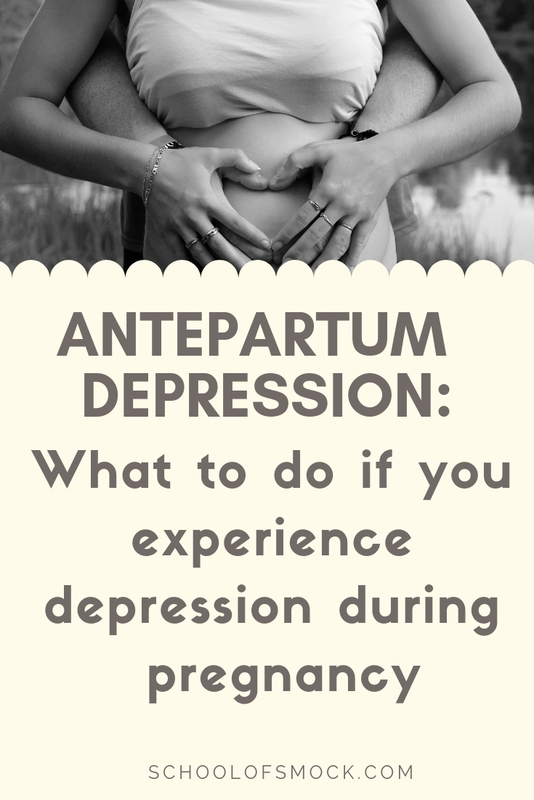 I honestly had never heard of antepartum depression. I’m glad you made it through and I’m glad you are brave enough to share your experience with others! I’d never heard of this! It’s great that you are bringing this issue to light, although I’m sorry you went through it. You were amazingly proactive in seeking help for the problem. Way to take care of yourself! I hope that other soon-to-be moms will read this post and find help like you did. Great post. I never knew there were psychiatrist who specialized in women’s reproductive mental health. I could have used that. Great job getting the word out. One Funny Motha recently posted…Walking Dangerously: Do You Let Your Kid Walk to School? I really struggled but fortunately I sought medical help and was able to pull through. One of the biggest challenges was the perceived societal pressure that this was supposed to be a happy, joyful time – not one of deep sorrow. I love reading your posts. I’m finding more often than not how much we have in common. Jennifer, I loved your post! I could relate to so much of it. I had no idea that these kinds of feelings were even possible during pregnancy. Our experiences are so similar. And, yes, I’m finding that we do have a lot of in common! Funny, I’ve been over here a few times before but hadn’t realized we’re both NY transplants from Boston who suffer from insomnia. I grew up in Hingham and live in New Hartford (Utica area) now. When I saw your reference to MGH, I had to check your About page to see if that was Mass General. Wow, a fellow upstate New Yorker who lived in Massachusetts! Do you go back to the South Shore? I have a friend from high school who grew up in Hingham and stayed there a couple times. I love the South Shore and one of the things that I miss most about New England is the ocean and beach so close by. My depression was so bad during my second pregnancy that I had to be hospitalized because I started feeling suicidal. Did you experience depression before your pregnancies? For those who’ve had previous depressive episodes, they are 40-60% more likely to experience depression during pregnancy. I was very depressed during my 20s. If you’d like to read about my experience, I wrote a blog post “My Miracle Child” about it. Thank you very much for sharing about your experience. Thanks, Frankie, for sharing your story. I’m so sorry about your hospitalization. I will check out your post. I don’t think I experienced depression before pregnancy, but I do think that I had other vulnerabilities. Looking back, I had post-partum and ante-partum depression. Pregnancy did not agree with me. Thank you for that thought provoking post! Jessica, this is such a brave post and I am so glad that you are sharing it. I had a bit of anxiety with my second pregnancy, I think I had like three nights in a row I didn’t sleep… and I did go see my ob/gyn and got some help. I didn’t realize how common depression was during pregnancy, too, so THANK YOU for talking about this. We just have this cultural assumption that pregnant women are giddy and happy and glowing, but the anticipation of all the changes of motherhood, plus the hormone bath our brains are in during pregnancy can certainly cause depression or anxiety. Lovely post and I am glad you got the help you needed. Wow, Jessica, this is one of my favorite posts you’ve ever written. The message is so important, and it makes me wonder why more of us don’t look at what’s going on with us mentally when everything seems fine. I could just picture you in bed, not sleeping, crying and worrying about the stress hormones that were leaking into your developing baby. I’m so glad you got help and I’m so glad that you’re sharing your message here. Powerful. And brave. And important. Kristi Campbell recently posted…Sometimes, I’m not myself. By my maybe-autistic son. Sortof. I suffered from antepartum and subsequently post-partum depression with the pregnancy and birth of my first child. I was in denial for almost a year. I still regret not acknowledging my depression earlier, so I could enjoy my daughter and maternity leave. For heaven’s sake, I am a family physician! I should have recognized it in myself. Hindsight is always 20/20. I took me a long time to forgive myself. Now, as I am close to delivering my 3rd child, I have moments where I am worried about how things will be after the birth. I’m pretty sure I’ll be okay. Seeing posts like this helps a lot. Dr. Mom recently posted…The Home Stretch. It is so tough to recognize the symptoms, whether it rises to the level of problematic or not, sometimes, even in yourself. Sadness, anxiety, sleeplessness, those are all such common experiences for everyone, but it’s so hard — even as a doctor apparently — to make the call about when it’s more than just everyday blues or worries. I’m so glad that you were able to forgive yourself. I’m so glad that seeing my post might give you a little more peace as well. Thanks so much for sharing, I think this is something people should be able to openly discuss. I’m in my third trimester of my first pregnancy, and I think I had a minor bout of depression in the first. I felt sad and unmotivated, and kept wondering when I was going to feel happy about being pregnant (which was planned). I think it was made worse that by the fact that I wasn’t really sharing it with anyone yet other than our families and a couple close friends. Thankfully things picked up in the second trimester, though I still have waves of sadness that come over me periodically. I think there is so much about pregnancy that is not talked about before you get pregnant, and apparently this is one of them. Thanks, Bev! Just checked out your page and saw that you are a fellow Wes alum! There is definitely a lot about women’s mental health — the combination of stressors, hormones, emotional and physical changes that impact a mother’s mood and mental stability — that don’t get discussed enough. I think there is so much growing awareness about postpartum depression, but depression during pregnancy is common too and not recognized enough! Thank you so much for sharing this. I have not experienced antepartum depression, but my experience with ppd allowed me to relate to so much of what you said – about feeling depressed and anxious when you shouldn’t – when everything is going “right” and as it should. It is such a scary experience to have your emotions be so out of your control. Pregnancy hormones are some strong stuff, and women should never be ashamed to get help, and if necessary, take medication. It’s amazing that in the age when we have all this info at our disposal, so many stories and people sharing their experiences openly, that so much is still a surprise! When I had my son in 2004, Facebook was just dawning, and certainly wasn’t off the Harvard campus yet. When I went thru postpartum anxiety I had no idea what was going on! I knew about postpartum depression, but had never heard about it’s tension-filled twin. I’m so glad that writers like you are sharing your stories, so that when someone is in crisis, knowing you’re not alone is just a google search away. Thank you! There really is so much support out there online, resources like Postpartum Progress. I hadn’t really heard of postpartum anxiety either. I didn’t exactly feel sad so I figured that it couldn’t be anything like that. It would make sense that women would experience this, because the hormones go so wacky during pregnancy. I was lucky in that respect that I wasn’t depressed during my pregnancy, but then I had Postpartum Depression with my daughter. Isn’t it amazing how powerful hormones are? I’m not looking forward to menopause, when everything could get all screwy again! I suffered from intense anxiety and some depression during my pregnancy, as well. I went to see a counselor during that time (rather than take meds) and it made a world of difference. I also found that yoga helped to relax me. But in general, my hormones totally hate me! I really have no desire to ever be pregnant again. Thank you, Jessica, for sharing. And I can certainly understand your sentiment about pregnancy being no fun. I think lots of women who do recognize that they might be depressed or anxious think that there are no other options besides medications. This isn’t true!